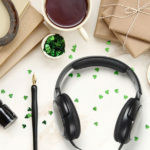 about new audiobooks, interviews, contests, special offers and more from Penguin Random House Audio. Want more? I would also like to get the latest news from Penguin Random House. Penguin Random House Audio Copyright ©2019 Penguin Random House LLC.